1.This series machine adopt manual control to oil inlet and outlet valve, hydraulic loading, and electronic measurement, auto processing data, and mainly used to perform tension, compression and bending tests for metallic and nonmetallic materials. 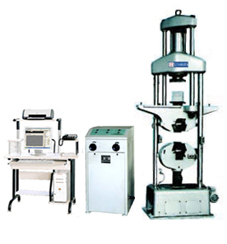 It completely accords with national standard GB/T16826-1997 Electro-hydraulic Servo Universal Testing Machine and GB/T228-2002 Method for Tensile Test of Metallic Materials at Room Temperature. Also complies with standard ISO, ASTM, JIS about materials requirements. It can get upper yield force, lower yield force, non-proportional extension strength, total extension strength, tension strength, elasticity modulus, extension under maximum force and other mechanical performance for different materials. If equipped with accessories, it can perform mechanical performance tests for high strength bolt, chain, steel wire etc. 2.Utilizing the transmission mechanism of double leading screws and middle beam, upper hydraulic cylinder, open jaw base, easy to install specimen, with high stability and nice appearance. 4.With special Windows software for computer screen display testing machine, and measure performance parameter for various materials according to national or user’s requirements. And make a statistical treatment to test data and can print all kinds of test curves and reports.